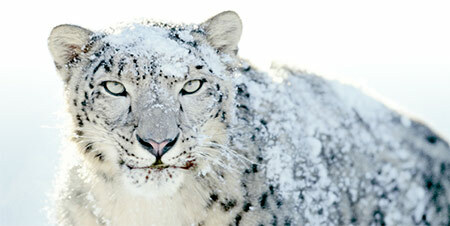 I finally took the plunge on Tuesday and upgraded my iMac from Leopard to Snow Leopard. Oops! Bad move, mister. My Photoshop CS3 started crashing on launch. Whose fault was this? Sounds like you could blame Apple or Adobe, but personally I’d say Adobe after reading this forum post. Adobe should have followed Apple’s guidelines on serial number length. For the record, my iMac’s serial number is “SystemSerialNumb”. Why? Because Apple replaced my logic board 2 years ago. Why didn’t they give the logic board a proper serial number? No idea, but it seems a bit slack of Apple. Anyway, all this is moot now because Apple have today released Mac OS X 10.6.4, which works around the issue. Yay! This just a day after I upgraded to Snow Leopard. Talk about lucky timing for me! Some poor sods have been stuck with no Photoshop since March because of this problem. One other unrelated problem with Snow Leopard: Google Analytics no longer works in Safari 5. I get the error “This page has encountered an error that may prevent it from working correctly.” Could be a problem Google’s end though. Problems aside, Snow Leopard seems lovely and fast so far. I can’t point to anything specific, but the whole thing just feels snappier somehow. Finder windows come up more quickly. Mail brings up messages and message lists faster. Browsing other Macs on the network is smoother. I no longer get a slight lag when typing into a form in Firefox. Apps launch more speedily. I also love the new Dock pop-up menus – they suit the Dock much better than the old grey menus that are used in the menu bar. Ooh, and I’ve just noticed that some apps, such as TextEdit, auto-correct text as you type (for example, “teh” -> “the”). Nice! For reference, you can toggle this feature by right-clicking and choosing Spelling and Grammar > Correct Spelling Automatically. Make sure your Time Machine is actually on! But why doesn’t the Time Machine menu bar icon show that TM has been turned off? Surely this is fairly critical information that would be useful to know? Since the icon doesn’t change, I had no idea that TM had been turned off for the past 2 months. Bad UI design, surely, unless I’m missing something obvious? 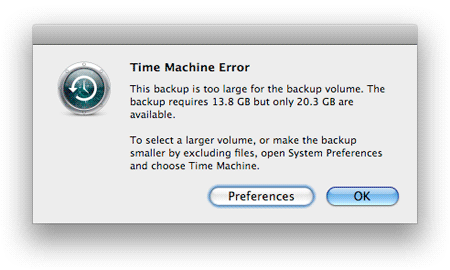 An additional warning: Even choosing the Back Up Now option doesn’t turn Time Machine back on. It does the backup, but then remains in the “Off” state afterwards. It’s almost like it doesn’t want to stay on! Can we trust Time Machine? One of the much-heralded new features of Mac OS X Leopard is, of course, the Time Machine backup system. Its key selling point – apart from the Dr Who-style restore screen – is the fact that it’s a “no-click” backup solution; you just plug in an external backup drive, and Time Machine gets on with the job of backing up automatically. I’ve seen the Unable to complete backup error on both our iMacs over the last few weeks. It’s a fairly common occurrence. I tried the trick of repartitioning using GUID rather than MBR on my Mac, which certainly reduced the errors, though I still get them. It looks like there are quite a few other Mac users experiencing this error, too. And what’s with that second error? The backup needs 13.8 GB, but only 20.3 GB are available? Looks like someone at Apple needs to go back to maths classes. How can I trust a backup system that can’t subtract two numbers? Frankly I’m tempted to go back to using rsync for my backups until Apple makes Time Machine more stable. At least I know rsync works! Malware: Coming soon to a Mac near you? Nothing is guaranteed to bring the smug Mac user brigade out in force like a discussion on viruses and trojans. “Oh, we don’t get those – we use Macs!” they proudly announce. And they have a point; Mac malware is pretty thin on the ground right now. Indeed, the first virus to specifically attack Mac OS X didn’t come out until 2006 – five years after Mac OS X was launched. Well the time for such smugness may be coming to an end. In the past few weeks we’ve had a published root escalation vulnerability, not to mention a Mac-targeted trojan in the wild that takes advantage of said vulnerability, and is evil enough to wipe the smile off even the smuggest Mac user’s face. Furthermore, Mac hackers have produced a tool to make future production of similar trojans almost trivially simple. Maybe we’re seeing an increase in Mac malware now because Macs are getting more popular, with 80% of businesses allegedly now using them. More Macs make for a bigger, juicier target. But Macs are secure – aren’t they? Yes, Macs are built on UNIX, and yes, UNIX is generally pretty secure and battle-tested. But UNIX and Linux servers are compromised every day. Maybe not as much as Windows machines, but there are plenty of worms and rootkits out there for Linux. If malware authors start targeting the Mac in earnest, it’s unlikely that Mac users will get off that lightly. We can only hope that Apple starts tightening up security in Snow Leopard, as Dino Dai Zovi suggests. Posted in Cult of Mac, Mac OS | Comments Off on Malware: Coming soon to a Mac near you? You are currently browsing the archives for the Mac OS category.